Ubisoft Returning to More Acceptable DRM? As many of you know, I started boycotting Prince of Persia: Epilogue DLC because the game was released on several platforms, but the story-continuing DLC was only released on two platforms... leaving the rest of us hanging. Later I extended the boycott to Ubisoft's games due to their release of the "Online Services Platform" (OSP) DRM that all future games (including TrackMania 2) were slated to be released with. This DRM required that the user be on a persistent internet connection in order to play the game. If the connection was disrupted for whatever reason, the game would drop out to the main menu, regardless of your progress. Needless to say, it was the frustration of many paying customers. The pirates didn't care, because they cracked the stuff within 24 hours and were playing their game without a required connection. I was ecstatic to start hearing rumors a few months back that Ubisoft is returning to a softer/gentler familiar DRM where one will only be required to be online for a one-time activation at install time. This certainly feels like a step in the right direction, if it's really true. I've been trying to track down official statements about this, and unfortunately haven't been able to find any. However, I have found several articles on the internet that lead me to believe it's really going to happen. PC Gamer - "Constant net connection no longer required for Ubisoft games." 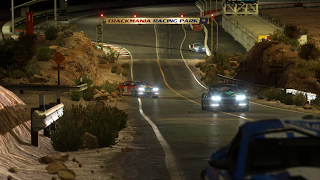 VG24/7 - "Ubisoft removes constant connection requirement from controversial DRM"
Rock, Paper Shotgun - "Good: Brotherhood will be 'Playable Offline'"
I've also been doing my own investigation into TrackMania 2 Canyon, and it's sounding like it won't be released under the OSP. Thus my boycott will be lifted. I will be pre-ordering TrackMania 2 Canyon (a few copies so I can play with my kids on my LAN and online.) I'm hoping Ubisoft will also remove the OSP from other games that have been already released under it, as there were several I wanted to play, like HAWX, and Prince of Persia: Forgotten Sands. If I can find official word, I'll be sure to post it here... for now I'll just offer thanks to Ubisoft if this is true. I've said it before and I'll say it again. I think many of Ubisoft's games are fantastic, and I'm more than happy to pay to enjoy these awesome games, as long as they don't punish those of us that are willing to support them! This shows some awesome gameplay (22 minute-long video), including tracks from the official trailer. Did I mention I soooooooo can't wait for this game?! Overlord Complete Pack - $5.00 on Steam - Today Only! If you haven't played this game, it's a clever take on the RPG genre. It's comical and irreverent and quite interesting to play. You're an overlord with different types of minions at your command; each with unique abilities that require different mixes of them for the different puzzles throughout the game. You also choose how to handle quests to build up your good and evil meters. Which will you be? Snag Overlord Complete Packfor $5.00 on Steam today if you haven't already... it's a riot. I'm loving what I'm seeing here; it's some of the nicest/sharpest looking gameplay I've seen to-date. This footage was taken at the DreamHack Summer 2011 TrackMania 2 Tournament. The main guy being highlighted in the video looks like his car is painted like the General Lee from Dukes of Hazzard. Want to play Portal 2 as you've never played it before? Need a Wii controller fix on your PC? Look no further... 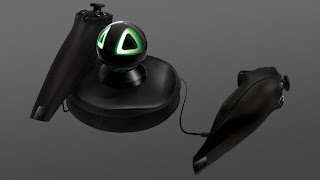 Steam is now offering the Razer Hydra PC Gaming Motion Sensing Controllers, along with a copy of Portal 2 and a DLC called "Sixense Motion Pack" containing 10 custom levels for Portal 2 to be enjoyed only with the new controllers. Check out the video on Steam's Store Page... it shows the Portal 2 gun in a whole new light. The price is a steep $139.99... hard-to-swallow if there isn't a whole lot more out there to use these controllers with, but hopefully we'll see more support for it in the future and maybe even have the price come down some by then. Pure goodness... this is what I was hoping for with TrackMania 2 Canyon being revealed at E3 this year... positive press from the USA Gaming Media. I hope this will bring a much larger fanbase to the United States since most USA PC Gamers haven't ever heard of the game. I feel if PC Gamer will do some serious coverage, including in their magazine before September, TrackMania will explode in the US arena. In the article on MaximumPC.com, PC Gamer discusses six PC games they believe to be dominating the show. Not only is TrackMania 2 Canyon on the list (albeit incorrectly named in the article) ... but a screenshot of it appears first in the article, right under the headline! This bodes well in my eyes... it's getting more/better press than I hoped so far. Let's hope it keeps after E3 ends today. Help spread the word! It never hurts to add more TrackManiacs to the mix. PS: See the Track Editor in action on PCGamer.com. One cool thing about this interview is that it's one of the USA racers/track authors Ubisoft invited to be with them at E3. He makes sure to mention that the entire game is "skinnable", as has been done in TrackMania United Forever. PPS: Don't forget to check out all the videos on the official TrackMania site if you haven't seen them yet. One of the important things in this video is that they quote the potential price range for the game: "between $15 and $30..."
Since it's just one environment, I'm hoping more for the $15-$20 price range. Here's to hopin'! Can't wait to see more footage and learn more about both TM2 and ManiaPlanet. Here is the gameplay footage they showed at the Ubisoft E3 Press Conference. It will make you wet your pants with joy; as it shows off the cool lighting effects, terrain, engine sounds, etc. of the game. Unfortunately, Ubi didn't give NADEO the same amount of stage time as most of the other games got, so I hope it was enough to wow the PC Gaming Media press enough to start covering this legendary game in their magazines, sites, etc. I so can't wait to play this game!!! ManiaPlanet Reveal at E3 - Live Online Monday! It's finally time for Ubisoft to bring marketing of the TrackMania universe to the United States of America! 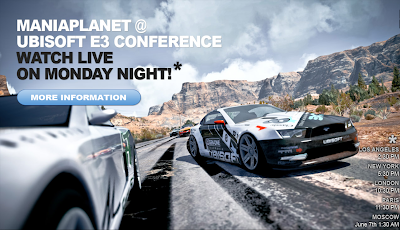 Monday at 3:30pm Mountain Time Ubisoft will be revealing ManiaPlanet, which will be launch with the release of TrackMania 2 Canyon. I can't wait to see it. I also can't wait to see how the gaming media in the USA responds... hopefully we'll start seeing a lot of TrackMania coverage so all USA gamers can be exposed to the goodness.